Do your friends often call you “corny”? Well, don’t let them discourage you from being you. No, instead take things to the next level. If they want corny, then give them corny. Don’t change a thing about the way you normally act and toss on this Adult Corn Stalker Costume for Halloween! When you walk into the costume parties this year everyone will get a good laugh at this hilarious costume. Feel free to have puns of fun with this awesome costume. Tell everyone about being a kernel in the Great Cornfield Wars. Always say how a-maize-ing everything is at the party. Jump out behind people and joke about stalking them. People may start to think this whole “corny” thing is getting old after a bit so let them know if they want to talk, you're all ears! With this costume you’ll give everyone a healthy dose of laughter, you’ll be the perfect side to an entree of fun, and you’ll have a better time in a vegetative state than you ever thought possible. Get a couple of your friends to check out the rest of our vegetable themed costumes. The whole lot of ya can go out as a fun and adventurous gang of veggies. We don’t know how but somehow you guys always happen to find yourselves wrapped up in some hysterical hijinks! 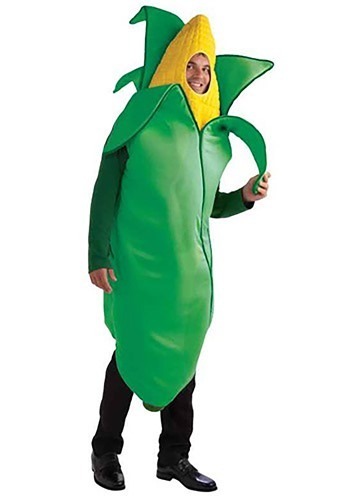 Tell everyone the amazing tales of being a veggie while wearing this goofy Adult Corn Stalker Costume. After this Halloween, no one will ever risk calling you “corny” ever again, not unless they want a repeat of this earie years celebrations!